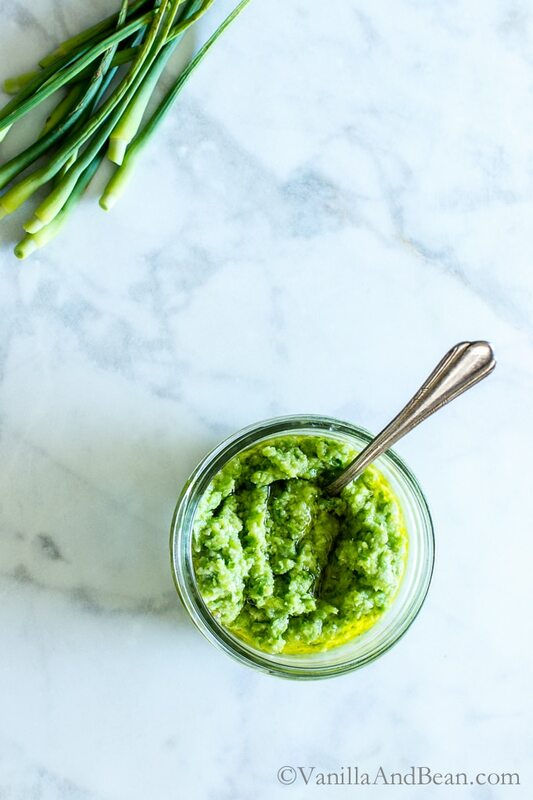 If you haven’t tried Garlic Scape Pesto, put this on your list! Find garlic scapes at your local farmer’s market, farm stand, or Co-Op during mid Spring to mid Summer. Their season is short so grab them while you can! vegetarian. *For a dairy free Garlic Scape Pesto, try my Vegan Garlic Scape Pesto. I had never tried garlic scape pesto until these beautiful curly scapes showed up in my CSA share. I’d had garlic scapes before, roasted, on pizza, in hummus and other delicious dishes, yet I had just not made pesto with them. I finally decided it was time… it blew my socks off! A garlic scape is the flower stalk of a ‘hardneck’ garlic plant. It tastes like garlic, only spicier! The stem is removed so that the remaining energy goes towards the development of the bulb, or head of garlic, which is good because this helps the plant develop a full flavored and good size head of garlic. So until the garlic harvest, we feast on scapes! It’s so quick to whirl this pesto up, enjoy it, and/or pop it in your freezer for a delicious summertime treat in the middle of winter. 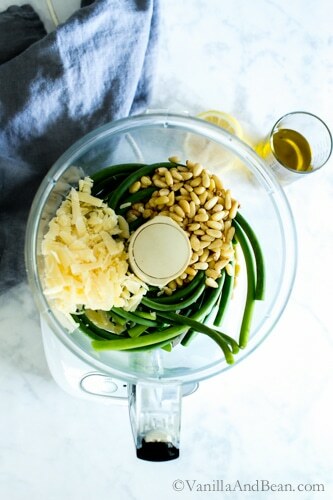 First, in the bowl of a food processor, add the scapes, nuts, cheese, salt, and lemon. Give the ingredients a whirl to break down. Next, with the food processor running, drizzle in the olive oil. Last, taste for salt adjustment and transfer into storage containers. I typically put it in a jar and freeze it, but pesto can also be spooned into ice-cube trays to freeze, then used later when smaller portions are needed. Also, garlic scapes can be blanched and frozen if preserving them whole or diced is preferred. Garlic is part of a group of plants known as alliums, which includes onions and leeks. Garlic’s health benefits are vast, including cardiovascular support, antiviral, antibacterial, and anti-inflammatory. It also supports the body in the prevention of cancer. It’s a superfood! And the flavor of this pesto? It is spicy, creamy, and gives any special dish that WOW factor! My favorite way to enjoy Garlic Scape Pesto is on Flatbread Pizza, pasta, crostini or in Creamy Farro with Pesto, Asparagus and Peas. But it’s also just as fabulous with a spoon! Um, um…. um. 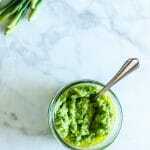 For a dairy free garlic scape pesto, try my Vegan Garlic Scape Pesto. Trim the garlic scapes by cutting just below the bulb. Discard the bulb and set the remaining scape aside. 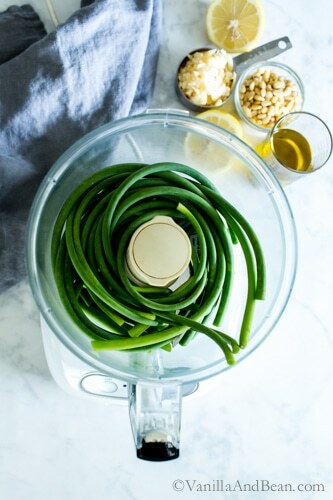 In a food processor, add the scapes, twirling them around the center so that they all fit. 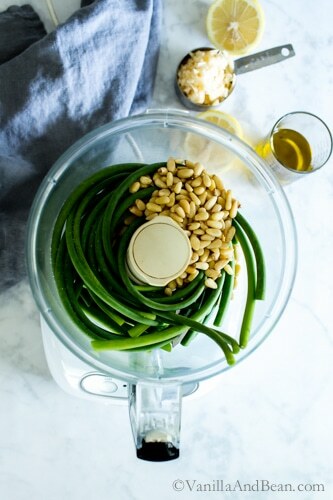 Add the pine nuts, cheese, juice of the lemon and salt and pepper. Process by pulsing until the mixture begins to break down. Scrape the bowl down. With the processor running, slowly add all the olive oil. Continue to process until all the ingredients are incorporated and broken down, about one minute. Store in a covered container or lidded jar in the fridge and enjoy within a week. Also, you can freeze the pesto in a jar or in an ice-cube tray. Once frozen, in the ice-cube tray, remove and place in a ziplock bag in the freezer. *The price of pine nuts have gone through the roof! Toasted walnuts will be a fine sub for this recipe. Simply rough chop the walnuts and measure 1/3 C (30g). **Parmesan Cheese: Look for vegetarian friendly Parmesan cheese (one that does not use rennet in production). BelGioioso vegetarian Parm can be hard to find, but Organic Valley is more widely available and Stella offers a vegetarian friendly Parm. I found this comprehensive list that shows brands who produce vegetarian friendly parmesan cheese. For more information, check directly with your preferred cheese maker. 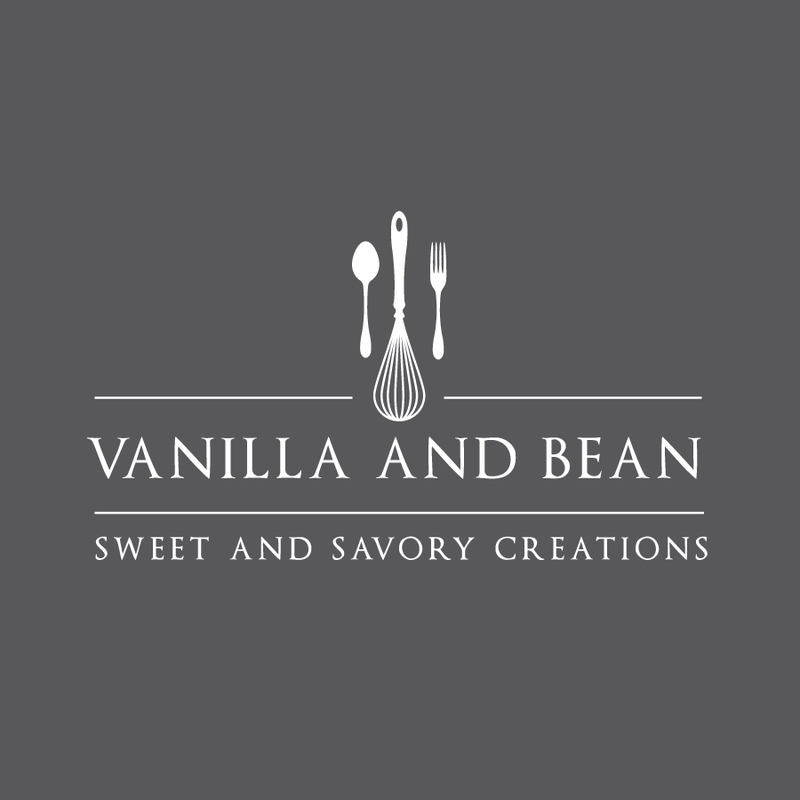 If you make this recipe, or any others on Vanilla And Bean, be sure to post it to Instagram and tag #VanillaAndBean! I’d love to see what you’ve made! Also, if you like my content, please consider sharing it with three friends and/or family. Thank you! My fave thing to do with CSA garlic scapes too! Lovely, Traci. Sometimes if I don’t get enough I add in some kale and that works beautifully as well. Oh my… Kale!? I’ve gotta give that a go! I bet the color is gorgeous! I just saw garlic scapes at the farmers market and did not buy because I didn’t know what to do with them. Next time though, I am grabbing some to make this so that I can use it as pesto on my homemade pizzas. Love the use of garlic scapes in pesto, sounds fresh and tasty! I made this pesto last year and loved it (especially pulling it out of the freezer in the dead of our New England winter)! Now I’m using up my garlic scapes and have a question about the recipe: when do you add the lemon juice? It’s listed in the ingredients, but I don’t see it added anywhere in the instructions. Thanks! Hey Lisa! Thank you for your note! I added some lemon as I updated this to brighten the pesto. Add with all the ingredients.. I’ve corrected the recipe. Hooray for Summer freezer food in the middle of winter! SO happy you enjoy the recipe! I’m making this recipe right now. The 1/2 lemon juiced is not mentioned in the instructions. Not an issue for me, but you might want to add it. Looking forward to this on crusty Italian Bread. Thank you so much Anita! I appreciate your note! :D On crusty bread? Yes please!! Thank you Meera and for your pin! I hope you can get your hands on some scapes! I have not tried garlic scape pesto Traci, but you know me, I’m totally game. I’ll need to grab some the next time I’m at my farmer’s market. I know they’ll have them. I’ve tried them in other dishes, so I know I’ll love the pesto! Hope you’re having a great time with your family. I bet you’re enjoying some great food! Safe travels! I made this last year and took it to a party. It was a hit. 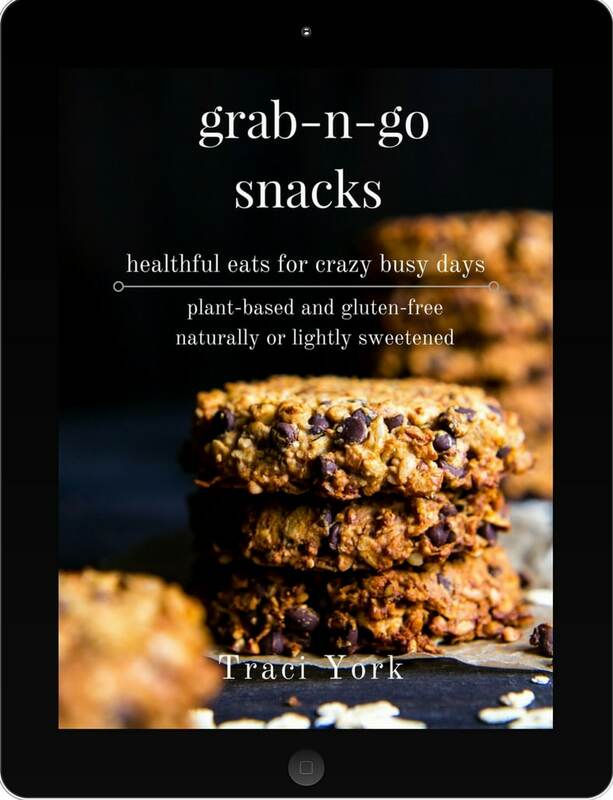 Thanks for another great recipe Traci. Enjoy the time with your family and come home safe! Hooray! Love hearing this Heide! Thank you for sharing and note :D .
Thank you for introducing me to Garlic Scape Pesto. I made this last year and loved it .. and just last week picked up fresh scapes from the Haliburton (Ontario) Farmers Market. Couldn’t wait to make it again .. which I did on Wednesday and enjoyed last night with zucchini noodles and fresh grape tomatoes .. delicious!! So happy to hear this Karin and thank you for your note! Zucchini noodles and fresh grape tomatoes sounds amazing! I’ll have to give it a go! 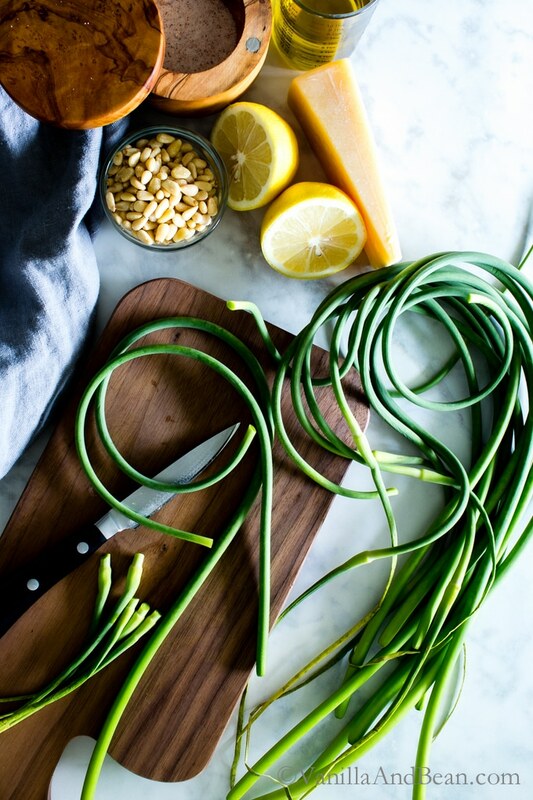 Thank you for the recipe and great ideas to put with scapes. We are fairly new to farming garlic. We are loving every aspect of it and always looking for new recipes for the he scapes. I will be trying this after we get done cutting all the scapes today!!! !thanks again. Renee. Traci, I’m so intrigued by this! I’ve tried garlic scapes when I was a member of a CSA group one year and loved them! I put them in hummus but I hadn’t thought of making them into a pesto. And I LOVE me some pesto! That piece crostini with the pesto and tomatoes looks drool-worthy. In fact, I think I’m drooling. Great recipe!!! I’m laughing, Allison! I would agree, this pesto is drool worthy! And it’s sooo good on pizza too. I’ll have to try scapes in hummus, if I can get my hands on another bundle! Thank you, Allison! YUM! Love garlic scapes…great idea turning it into pesto. By the way, are garlic scapes the same as garlic sprouts? When I lived in Asia, garlic sprouts (looked similar to the scapes) were used in Chinese cooking. Good question! Garlic scapes are produced from the variety of garlic known as hardneck Rocombole. So I am wondering if garlic spouts are just from a different variety of garlic. Are the sprouts curly like garlic scapes? Its nice to have a change of pesto from time to time! Thanks, Medha! I’m a pesto fanatic so I really DO need to try this! It looks beautiful and delicious – I need to get some garlic scape! Hi Jessica! Thank you! I know, right? Put it on the list! I just want to know who is snacking on this delicious treat while you were taking pictures? Why, it was me! I couldn’t resist. LOL! Hi Olivia! You’re welcome! 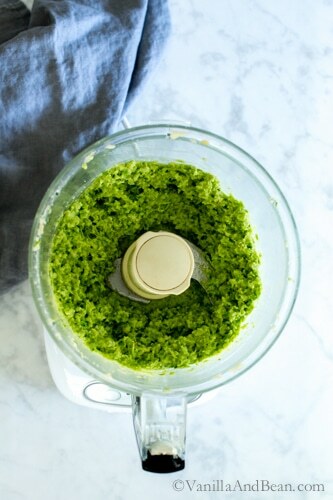 This pesto would pair beautifully with your delicious whole wheat pizza dough! Yum, Traci, this look delicious. I love a pesto that is not basil-centric. I would definitely go for the crostini topped with cherry tomatoes since my little garden is about to be overflowing with cherry tomatoes! Your photos are great – love the shot of just the scrapes all curly q. Thank you, Geraldine! I’m not a much of a basil pesto fan either. How fun that you’ve planted and are about to enjoy an abundance of cherry tomatoes! Oh the possibilities are endless!